Palestinian officials say “Israeli” forces are guilty of indiscriminant murder. “Israel’s” Avigdor Lieberman says his soldiers deserve a commendation. Shockingly, both are talking about the same event, when tens of thousands of Palestinians gathered in the besieged Gaza Strip to mark Land Day – the anniversary of the expropriation of Palestinian lands in 1976. The protests also kicked off a six-week rally, dubbed the Great March of Return. 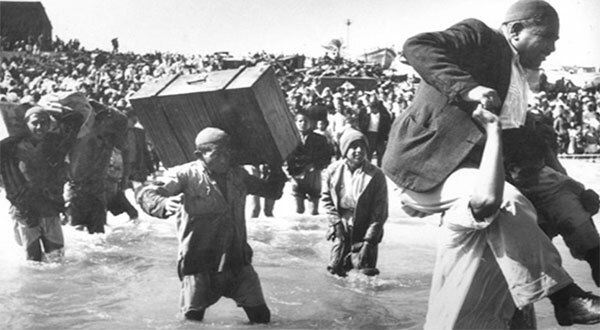 The demonstrations will carry on until the Nakba anniversary on May 15, marking 70 years since 750,000 Palestinians were expelled from their villages and towns by Zionist militias. But in just one week, the “Israelis” have already martyred 30 Palestinians and wounded thousands of others. According to “Israeli” officials like Lieberman, the Palestinian protesters are guilty of ‘charging’ the fence that separates Gaza from the remainder of occupied Palestine. “”Israeli” soldiers did what was necessary. I think all our soldiers deserve a medal,” Lieberman said last week. The “necessary” appears to include a combination of live rounds, rubber-coated steel pellets, unmanned drones used to unleash tear-gas, and artillery fire. On the receiving end of this massive firepower are unarmed Palestinian youths like Abdel Fattah Abd al-Nabi. Footage posted online shows this 18-year-old running with a car tire in his hand, before being shot in the back by an “Israeli” sniper. The 11-year-long deadly blockade of Gaza and three massive, genocidal attacks in just over five years certainly reinforce the argument that the “Israelis” are not too concerned with taking Palestinian lives. However, massacring dozens of protesters in broad daylight also suggests that Tel Aviv is by no means indifferent when it comes to peaceful methods of resistance and remains highly sensitive to the Gandhian approach. Gandhian tactics of unarmed protest have been widely used in the West Bank for decades. Now the strategy has been adopted en masse by Palestinian resistance groups and residents in Gaza – a place often demonized by Tel Aviv and its allies as a hotbed of terrorism. But perhaps the biggest threat to the “Israeli” occupation of Palestinian lands is the size of the demonstrations. Although much of the western coverage of the Middle East loves to label “Israel” as the region’s ‘only liberal democracy’, Tel Aviv’s actual policies expose a drastic dissonance between such descriptions and the reality on the ground. In no other category is this more evident than in Tel Aviv’s pursuit of ethnic purity. In an effort to preserve their racial makeup, the “Israelis” have gone as far as injecting Ethiopian immigrants with birth control, often without their knowledge or consent, while introducing an effective ban on marriages between “Israelis” and Palestinians. More importantly, in 2015, the “Israeli” Supreme Court provided legal cover for the demolition of Palestinian communities, making it that much easier to simply shove Palestinians off their own land. Meanwhile, in 1950, the “Israeli” Knesset passed the so-called Law of Return that allows Jews from anywhere in the world to claim citizenship in “Israel”, while barring Palestinians expelled after various wars from returning home. As such, the ethnic purity of “Israel” is contingent upon the 1.8 million Palestinians – 80 per cent of whom are refugees – remaining in an open-air prison in the Gaza Strip. The consequences of these policies often manifest themselves in the form of “Israeli” soldiers killing unarmed protesters – a practice involving heavily armed troops doing little more than ‘defending’ “Israel” from a population regarded as a demographic threat. The Palestinian Authority described the US Ambassador to the United Nations, Nikki Haley, as the ‘ambassador of hatred’ after she blocked any condemnation of Tel Aviv for the latest slaughter of Palestinians. Last April, Haley famously stood up during a UN Security Council meeting and displayed images of Syrian children allegedly killed by the Damascus government in a gas attack. However, last weekend, Haley failed to show any such compassion for Palestinian children, killed in full view of the world’s media, with no disputes over who perpetrated the killings. Instead, the US diplomat first blocked a draft statement urging restraint and calling for an investigation into the killings, and then rose to greet her “Israeli” counterpart Danny Danon with hugs and kisses. In many respects, Land Day is also a reminder of the decades of “Israeli” impunity against Palestine and the western-backed Zionist expansion, which is defined by colonialism, racism and the obliteration of Palestinian heritage.